ATHENS—For the Georgia Bulldogs’ first spring practice of 2015—the first of two without pads and in shorts before full pads this Saturday—all eyes might have been on the three quarterbacks competing for the starting position under center, new offensive coordinator Brian Schottenheimer, and star tailback Nick Chubb; however, most ears, at least when I was observing practice, were surely tuned into defensive coordinator Jeremy Pruitt. There was really no other alternative. While working with the secondary, Pruitt repeatedly commanded loudly for the Bulldogs’ defensive backs—all 100 of them, it seemed—to “do it again!” among several other firm orders. 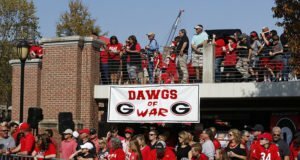 The booming directives were somewhat ironic coming from a coach who gives few interviews and has hardly been heard from by a good portion of Georgia fans. Last season, Pruitt inherited a defensive unit that had been arguably the worst in Georgia history the year before. The pass defense had been especially weak in 2013. 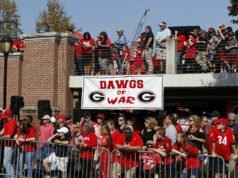 In addition, starting from the time Pruitt first set foot in Athens a little over a year ago, the Bulldogs began losing defensive backs at an alarming rate due to various reasons, especially due to transferring out of the program. 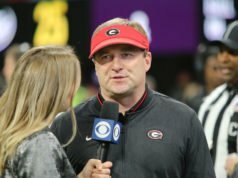 Still, filled with primarily question marks and hardly any standouts and with Pruitt personally coaching the secondary, Georgia’s pass defense last season yielded a passing efficiency rating of only 105.79, or the second-lowest at the school in eight seasons. Still, the Georgia secondary certainly has some room for improvement in 2015. So, what can the Georgia defense improve upon the most in 2015? Sanders, who routinely answered questions asked by the media with a “yes, sir” or “no, sir,” might be the best of a number of examples of young members of Georgia’s secondary who have excelled in part because of Pruitt’s strict discipline and structure. Many of the other defensive backs should eventually follow suit, and Georgia’s secondary—once considered a weakness not long ago—could be one of the best in the SEC this year. Finally, as I moved on to watch another unit practice on this inaugural practice of the year, I heard Pruitt’s voice above all others again. This time, he went off—I mean, really exploded—on a second-year cornerback, displaying a “do it or, if you don’t like it, get out” attitude. 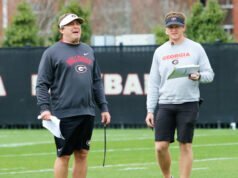 While some may find Pruitt’s discipline harsh, it’s a sight, and sound, welcomed by those, even as early as the first spring practice, once accustomed to a disorderly and overmatched Bulldog secondary.